Alex Marshall is the transportation columnist for Governing Magazine and the author of "How Cities Work: Suburbs, Sprawl and the Roads Not Taken." He is also a senior fellow at the Regional Plan Association. Here’s what the city can do to get more cyclists using those new bike lanes and out onto city streets in general. Change the legal relationship between pedestrians, cyclists and drivers. In boating, the slowest, smallest vessel has priority, generally speaking. Thus the motorboater looks out first for the sailboater, not the other way around. If drivers knew their insurance rates would go up if they hit a cyclist, they would be more cautious. Something similar should happen here. Although the passage of “Elle’s law” helped, right now, when a driver hits a cyclist or a pedestrian, there is still no presumption of fault, even if just for liability purposes. That should change. If drivers knew their insurance companies would raise their rates or cancel their policies if they hit a cyclist or pedestrian, they would be more cautious when turning onto a crosswalk or opening a car door. Right now, more people don’t bicycle because it’s simply still too dangerous, even with bike lanes. From my studies of the Netherlands and other bike-saturated places, it is the proper arrangement of these legal lines that is even more important than the painted lines on the streets marking a bike lane. Clarence Eckerson/streetsblog.org Kent Avenue, in Brooklyn, was once a two-way street. Return many of the city’s avenues and streets to being two-way again, as most of them used to be before World War II. Despite what the traffic engineers say, a two-way street is a safer street, one that is more navigable to walker and cyclists – and drivers for that matter. Now a cyclist must often travel around his elbow to get to his thumb – or cycle the wrong way on a one-way street, which endangers everyone. Sometimes the city, as with Kent Avenue, in Brooklyn, has converted a two-way street to a one-way street to put in a bike lane. This should stop. 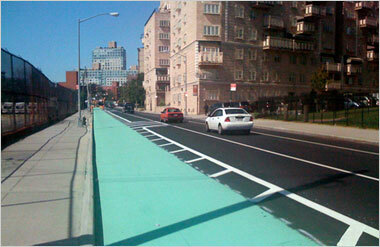 Promote biking on regular streets, and thus avoid “ghettoizing” cyclists into bike lanes. One problem now is that the bike lanes are usually put on larger streets and avenues, which means that cyclists are mixing with higher speed traffic and higher volumes of traffic. One solution is to make clear that bikes are appropriate on most city streets, even those without bike lanes. Start a bike sharing program, as Paris, Barcelona and even Washington, D.C., have done. If bicycling ever does really catch on in this city, than bike storage will be a huge challenge, given the city’s density. One way to ease this problem is to have a large supply of bikes on the street, ready for easy use for free or a nominal fee. That way cyclists don’t have to store their personal bikes on the street or inside their offices, but can turn over the bike they just road to be used by someone else. The Big Apple is behind the curve here. Start an annual fashion award for the best-dressed man or woman on a bike. One of the best trends in the city is the high-heeled, flowery-dressed woman or tweed-suited man making their way by bicycle through the city. It’s harder to drive like a maniac when you’re behind one of them. I’m not surprised there has been a backlash against the city’s bike promotion efforts. To every revolution there is a counter-revolution, and attempts to return to the status quo ante. And cyclists are fighting for a chunk of that most valuable of New York City real estate, its streets. Of course it doesn’t come easy. But the bottom line is that more cycling is a key route to having a healthier, saner and more livable city.